"The Last Jedi" reveals that Luke Skywalker has a small collection of books, which Rey takes with her when she leaves Ahch-To. The books appear tucked on a shelf within an uneti tree on Luke Skywalker's hideaway of Ahch-To. But the handful of books stood out to at least two viewers, who happen to spend their workdays studying the terrestrial equivalents of these objects. So they teamed up to sleuth out as much as they could about Luke's library by studying the books as if they were medieval manuscripts here on Earth. 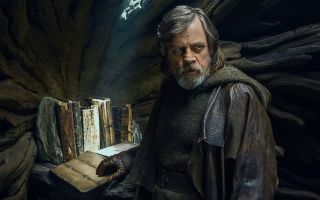 His collaborator on the project said that the glimpse of the books gives a depth to the Jedi traditions that are at risk of dying out with Luke. "I think the implication is these texts, that is the books, are very old, potentially thousands of years old, and so they point to a written culture — or overlapping cultures, maybe — that go back and back," Dot Porter, a curator at the Schoenberg Institute for Manuscript Studies at the University of Pennsylvania, told Space.com. "The books are a reminder that maybe it hasn't always been all data." In their day jobs, both Hawk and Porter use books (the physical objects themselves) and the texts they contain (a text can be spread between books and a book can contain multiple texts) to learn about the past. So they decided to apply those same skills to Luke's books, as seen in brief glimpses in "The Last Jedi," as well as in a real-world book called "The Art of Star Wars: The Last Jedi" (Harry N. Abrams, 2017) which offers an inside look at the film's production. The result is a series of videos that Hawk and Porter will release every couple weeks between now and December, when "Episode IX" hits theaters. The videos highlight more than a dozen manuscripts in the Schoenberg collection that the pair connect with the questions they want to tackle about the books. Take, for example, the materials that went into Luke's books. Medieval manuscripts are typically written on paper or animal skin and bound in leather, wood or other natural products. Wood makes an appearance on Ahch-To's shelf, but has more exotic neighbors. Some of the covers appear to be made of horn or shell, for example. "It doesn't look like leather or anything that you would have on Earth to tie the binding together; it looks very foreign, it looks very alien," Hawk said. "They seem so natural to the 'Star Wars' universe, like — of course, that's exactly what a book would look like from 'Star Wars'; it's made of alien stuff." And for Porter, the covers are cues about the worlds these books come from. For example, one book cover appears to be made of tusk. Presumably, Jedi on that planet must have been able to harvest some sort of large, tusk-bearing critter to create that binding. "Maybe they don't have trees, or they use trees for something else — you can sort of start to imagine what the planet would be like," Porter said. She sees signs of how technology might pass between communities as well. In the tusk-covered book, three strips of tusk appeared to be sewn together vertically — a plausible solution to a potential constraint of using such a material, although not a technique ever seen in terrestrial manuscripts. But then a wood-covered book displays the same strip-based construction, even though trees could likely grow to thicker widths. Inside, the books also evoke a strange spin on something deeply familiar. In the movie, viewers barely see inside the books, but "The Art of Star Wars" features a half dozen images of pages, which include diagrams that appear to be vaguely astronomical and texts in writing systems vastly different from our alphabet. That's an awfully good match for medieval manuscripts. To compare, Hawk and Porter gathered manuscripts in a range of writing systems, from German to the Ethiopian Ge'ez script. And many manuscripts — including many highlighted in the series — deal with scientific or science-adjacent topics like astronomy, astrology, health and engineering. "Often people write off the Middle Ages as having very little science, or no science, or it was a period where science was sort of eclipsed by religion or other things," Hawk said. But just as the Jedi traditions continued into the era of incredible technology like hyperspace drive and elaborate droids, science and religion co-existed during the medieval period on Earth. "Science sort of is everywhere in some ways; there are some really important ways that science infiltrates all sorts of things." But there's one piece of medieval manuscript studies that the "Star Wars" books neglect: Porter quibbles with the complete absence of scribbled notes in the margins, spilled drinks, folded pages and other indications that the books have actually been used. (Such signs of use are on display in digitized versions of the manuscripts they discuss.) "They're clean, they're beautiful, it looks like nobody's touched them," Porter said. "Everything else I thought totally believable." Even after spending hours poring over medieval and imaginary manuscripts, the duo have some lingering questions that they hope will be resolved in "Episode IX." "I think I would like to know something concrete," like a scribe's name or the planet where a book was created, Porter said. "I want to know where one of them came from, give me some cultural background." Hawk is hoping for a glimpse of the texts in action. "The literature-lover side of me really wants to see somebody read a piece of a manuscript," he said. "I'd love to see a text on the page that somebody reads that ends up being the Jedi code or a hymn or something that tells us that this is still a fabric of their society." After all, Porter pointed out, C-3PO is supposedly fluent in 6 million forms of human communication — maybe he can translate for Rey.